Teaching music appreciation can be easy and fun! 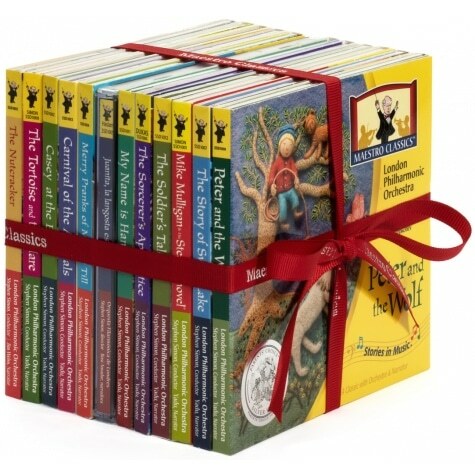 Head over to Educents to snag The Maestro Classics 12 CD Collection for just $75.20 plus free shipping. That’s over 60% off the regular retail price! Just use coupon code HOLIDAY at checkout. This set includes 12 CDs and a curriculum guide for each CD. In addition to the title track, each CD contains tons of extras including guest artists performing in different musical genres, the title track with and without narration and educational tracks with information on the composer, piece and musical score designed to increase listening skills in children and also adults. The guides include activities for math, science, music, art, language arts, history and geography for each CD. Click here to see the full The Maestro Classics 12 CD Collection deal!